Despite our "higher intelligence," humans as a species are drifting toward a spectacular failure to adapt. A cattle ranch in Montana - Throughout the world, native grasslands, forests and wild species have been burned, butchered and brutalized for cattle ranches. Rational, reasonably well-educated and intellectually honest people (obviously that excludes 40 percent of the country and all the Republicans on Capitol Hill) know that the looming climate crisis threatens modern civilization, if not humankind as a species. Ironically, while humans' accelerating abuse of our planet is now widely recognized as responsible for the sixth great massive species extinction since the earth was formed, we are rapidly setting the table for our own mass extinction, and due in large part to - what we are setting on our tables. TransCanada, Exxon Mobil, the Koch brothers and Fox News are widely demonized as the enemies of meaningful action on the climate crisis. No argument there, and given that their obstructionism will lead to misery and death for billions of people, why are we not putting them on trial for crimes against humanity? But for far too long what we eat, the corporations that produce what we eat and entice us and our kids to want what they produce, have continued to operate in our climate blind spot. McDonald's, Burger King, Wendy's, Coca-Cola, Kraft and the entire "processed, fast food" empire are just as guilty as Peabody Coal of leading us to our own extinction. "Happy Meals" may eventually become our last meals. As the countries of the tropics become increasingly integrated into the global economy, and there is steadily increasing demand for ever-limited natural resources, efforts to protect the region continue to be undermined by unsustainable economic demands. Wholesale exploitation and destruction of soil, water and vegetation in order to provide cheap beef to the developed world is wreaking havoc on the ecosystems that sustain all life, including human life. Cliven Bundy's unpaid cattle grazing bills from the US Bureau of Land Management (BLM) don't even scratch the surface of the damage that his and other ranchers' cattle do to the environment. The once mighty Amazon jungle is regarded as the lungs of the planet because of its pivotal role in absorbing carbon dioxide and releasing oxygen. It is also increasingly thought to be the heart of the planet because of its role in moving moisture, wind and weather patterns throughout the globe. The Amazon is also home to more than half of the world's species of plants and animals. But the Amazon and other tropical forests are under assault because of the pressure to exploit their natural resources. Every minute, a piece of virgin rainforest roughly the size of 36 football fields is destroyed. Thirty-six, every minute. At the top of the list of culprits is Western culinary culture, which worships the "golden calf," i.e. beef - cheap hamburgers. Just as smoking is harmful to your personal lungs, hamburgers are killing the planet's lungs. Throughout the world, native grasslands, forests and wild species have been burned, butchered and brutalized for cattle ranches. 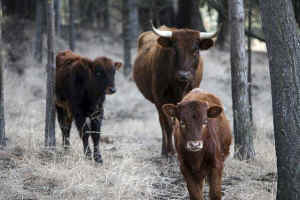 Eighty percent of the deforestation of the Amazon has come at the hands of the beef industry. Semi-deciduous forests in Brazil, Bolivia and Paraguay are cut down to make way for soybeans, which are fed to cows as high-protein soycake. Since 1960, more than 25 percent of Central America's forests have been destroyed to make way for cattle ranches, with most of the beef exported to the United States and Europe. For every quarter-pound fast-food hamburger made from Central American beef, 55 square feet of tropical forest, with all its plant and animal life, is destroyed. In the past 20 years, the majority of the rainforest in Costa Rica has been lost to cattle ranches. By the mid-1990s, cattle pasture land in Honduras had swallowed over 40 percent of the country's fertile acreage. Raising beef in the tropics is as short-sighted as lighting your furniture on fire to keep your house warm. Land that was once rainforest has only a short life span in supporting cattle grazing. Rainforest soil is poor in quality, nutrient deficient, making cattle grazing in the tropics grossly inefficient. Initially, each hectare of cleared land may support one animal, but after six to eight years, each animal may require five hectares. Without the forest, the soil quickly becomes very dry. The grass often dies after only a few years and the land becomes a barren desert. The cattle farmers then have to move on and destroy more rainforest in a vicious cycle to maintain grazing capacity. Despite this, destroying rain forests for cattle remains highly profitable. By simply clearing forest and placing a few head on the land, colonists and developers can gain title to the land in countries like Brazil. The land tenure system in many countries promotes conversion of land from a natural productive asset to a "manmade" one by wealthy landowners and speculators. Pasture land prices exceed forest land prices, making land clearing a good hedge against inflation, especially in many Central American countries that have had a painful history of explosive inflation. Recently, when the Brazilian currency, the real, was devaluated, the price of beef in real approximately doubled, creating a huge incentive for ranchers to expand their pasture area. At the same time, the price of Brazilian beef in dollars fell, which made Brazil's exports more competitive on international markets [Kaimowitz et al. 2004. Hamburger Connection Fuels Amazon Destruction: Cattle ranching and deforestation in Brazil's Amazon. Centre for International Forestry Research (CIFOR). 10 pp.]. Cattle have low maintenance costs and are highly liquid assets easily brought to market because the Western appetite for beef continues to grow. Cattle don't require much up front capital, and are a low-risk investment relative to cash crops, which are more subject to wild price swings and pest infestations. Tropical deforestation for cattle and beef production is contributing significantly to the dramatic loss of biodiversity, including species extinction. Preserving species preserves the overall biological gene pool, which enhances the chances of survival for all life forms, including humans. Each species depends on the services provided by other species to ensure survival. Diverse, healthy ecosystems allow all organisms a better chance to recover from a variety of disasters. Metastasizing cattle ranches are not just an issue for the tropics. The cattle industry has undoubtedly caused more environmental destruction in the western United States than all the highways, dams, strip mines, oil drilling and power plants put together. The US government through the BLM has long capitulated to ranchers making cattle grazing the predominant use of Western public lands. The BLM goes so far as to spray herbicides over large tracts of range eliminating vegetation eaten by wild animals and replacing it with monocultures of grasses favored by cattle. Overall your personal carbon footprint may be determined more by what you eat than by anything else you do. Let's put this another way. Avoiding the devastation of the climate crisis may be impossible unless most of us in the developed world change our eating habits. Likewise, feeding the world's billions will become impossible with either current or projected meat consumption. Grain-fed cattle are responsible for huge quantities of the three main green house gasses: carbon dioxide, methane and nitrous oxide. Our dysfunctional food system is responsible for one-third of all human-made greenhouse gases, according to the Consultative Group on International Agricultural Research (CGIAR), a partnership of 15 research centers around the world. A 2006 report by the UN Food and Agriculture Organization (FAO) calculated that our diets and, specifically, the meat we consume, cause 18 percent of human-made greenhouse gases - more than either transportation or smokestack industries. Merely the burning of forests for cattle ranches is responsible for the release of 340 million tons of carbon to the atmosphere every year, equivalent to 3.4 percent of current global emissions. Nitrous oxide is a greenhouse gas about 300 times more potent than carbon dioxide. It is emitted by numerous natural sources as part of the nitrogen cycle, but the amount emitted by human activity is steadily increasing and now amounts to about 40 percent of the total amount in the atmosphere. Agriculture - livestock production in particular - is one of the primary, human-caused sources of nitrous oxide. It is released from the bacterial breakdown of synthetic, nitrogen based fertilizers in the soil and from the breakdown of livestock manure and urine. To much fanfare, the Obama administration announced an important plan to reduce carbon dioxide emissions from power plants, but not even lip service is given to reducing nitrous oxide, which is projected to increase by 5 percent between 2005 and 2020, driven largely by increases in emissions from agricultural activities. Half of the greenhouse gases associated with the livestock industry come from methane. Over a 100-year time frame, methane is at least 25 times more potent than carbon dioxide as a greenhouse gas and over a shorter lifetime, even more potent. Methane from livestock alone adds up to around 7.1 gigatons per year, or 14.5 percent of all human-caused greenhouse gas emissions, according to the FAO. Our farming system of grain-fed livestock consumes resources far out of proportion to the useful dietary yield. Producing half a pound of hamburger for a patty of meat the size of two decks of cards releases as much greenhouse gas into the atmosphere as driving 10 miles in a 3,000-pound car. Think about that next time you drive to work. Producing that same amount of beef also requires nearly 1,000 gallons of water. Much of that water comes from non-renewable sources like the Ogallala Aquifer, perhaps the most important body of water in the United States and believed to be the largest body of fresh water in the world. The farm acreage dependent on the Ogallala yields about 20 percent of US grain production. However, in a brief half-century we have drawn the Ogallala down from an average depth of 240 feet to about 80 feet. This is essentially water "mining" because recharge of this aquifer is not even close to keeping pace with the extraction rate. David Brauer of the Ogallala Research Service, a US Agriculture Department agency, said, "The Ogallala supply is going to run out and the Plains will become uneconomical to farm. That is beyond reasonable argument. Our goal now is to engineer a soft landing. That's all we can do." And the disturbing truth is that much of that precious, one time gift of water is being squandered on hamburgers. Apart from the Ogallala, the most important water resource in the western half of the country is the Colorado River. It has long been recognized as over allocated and vulnerable to much reduced flows with the climate crisis, but a recent study about just how fast that water is disappearing is truly frightening to anyone who lives in the West and should be to anyone who enjoys eating all the produce that depends on that water, i.e. the entire country. "We were shocked to see how much water was actually depleted underground," said the lead author of the study, Stephanie Castle, a water specialist at the University of California at Irvine. Lake Mead is at its lowest level since the Hoover Dam was built, and Lake Powell is below 50 percent of capacity. And just like the Ogallala, much of the Colorado River water is being squandered on hamburgers. Beef's environmental impact dwarfs that of other meat including chicken and pork, new research reveals. In fact, eating less red meat would be a better way for people to cut carbon emissions than giving up their cars. Driving a Hummer to work and eating a salad for lunch is probably a lower carbon footprint than riding your bike to work and eating a hamburger. A meat lover's diet requires double the carbon footprint of a vegetarian diet. According to a recent study published in the Proceedings of the National Academy of Sciences, beef requires 28 times more land to produce than pork or chicken, 11 times more water and results in five times more climate warming emissions. When compared to staples like potatoes, wheat and rice, the impact of beef per calorie is even more extreme, requiring 160 times more land and producing 11 times more greenhouse gases. Seventy percent of all US grain production goes to feed livestock, not humans. An estimated 30 percent of the earth's ice-free land is directly or indirectly connected to livestock production. Ruminant animals (those with multiple stomach compartments and use regurgitation and fermentation to digest plants) like cattle make far less efficient use of their feed. Because the stomachs of cattle are meant to digest grass, not grain, cattle raised industrially thrive only in the sense that they gain weight quickly. Only a minute fraction of the food consumed by cattle goes into the bloodstream, so the bulk of the energy is lost. Feeding cattle on grain rather than grass exacerbates this inefficiency. The end result is a cow may emit 1,000 liters of methane and carbon dioxide a day. In the average Western diet, animal products make up 60 percent of greenhouse gas emissions despite accounting for just a quarter of food energy. Lindsay Wilson at Shrink That Footprint compares the carbon footprints of various diets in a very enlightening exercise. Assume consumption of around 2,600 kilocalories of food energy each day, roughly equal to an average American's. In each diet, food energy is split up among nine different food groups. The five diets are: the Meat Lover - eats a lot of red meat, white meat and dairy in place of some cereals, fruit and vegetables. The No Beef - just the average diet with all beef consumption switched to chicken. The Vegetarian - switches away from beef and chicken to fruit and vegetables, while also reducing oils and snacks. The Vegan - does much the same as the vegetarian while also eliminating dairy through further switching to cereals, fruits and vegetables. Red meat is the most carbon intensive way to get food energy, followed by dairy, fruit and chicken. Somewhat unexpectedly, cereals, oils and snacks are the least carbon intensive. Oils, snacks and cereals are each highly calorific and have relatively low losses and waste, which results in them performing very well. The opposite is true of fruits and vegetables, which are less calorific per unit weight, but have a very high share of consumer waste and supply chain losses, decreasing somewhat their "carbon advantage." A hot house tomato can have emissions five times higher than one grown in season. Potatoes have tiny footprints compared to many other vegetables, and cheese has much higher related emissions than milk. High meat-eaters contribute an average 7.19 kilograms of carbon dioxide equivalent each day, while vegetarians contribute 3.81 kilograms of carbon dioxide equivalent and vegans contribute 2.89 kilograms of carbon dioxide equivalent. In addition to being a land use and climate disaster, the livestock industry is responsible for one of the largest sources of contamination of water and topsoil. Agriculture in the United States - much of which now serves the demand for meat - contributes to nearly three-quarters of all water-quality problems in the nation's rivers and streams. The EPA allows agriculture exemption from the Clean Water Act even though 60 percent of our rivers and streams are considered "impaired" due to agricultural water wastes. The recent contamination of drinking water for 500,000 people in Toledo, Ohio, is related in large part to the livestock industry. The blue-green algae that excrete the deadly cyanobacteria thrive in warm waters (and obviously will be exacerbated by the climate crisis) when there are high levels of nitrates and phosphorus to feed upon. Years ago, states surrounding Lake Erie had banned or severely limited phosphates in detergent - which reduced algae proliferation. But like many other critical bodies of water throughout the country, Lake Erie is the ultimate destination of large amounts of nitrogen and phosphorus released from farm runoff. Fouling our drinking water is another cost of our worshiping the "golden calf." Plants and animals become extinct when they fail to adapt or evolve quickly enough to threatening perturbations in their environment. Despite our "higher intelligence," humans as a species are drifting toward a spectacular failure to adapt. The climate crisis is on par only with nuclear holocaust as a threat to our collective survival. Warding off either one is thoroughly dependent on our willingness to cooperate in averting disaster. What you eat greatly affects the viability of my granddaughter's future. A higher intelligence without a higher moral platform, and a commitment to sacrifice for the greater good, affords little defense against extinction. In a subsequent article, I'll examine the personal health consequences of eating meat, cattle in particular. Read Apocalypse of the 'Happy Meal': The Cathedral of Cholesterol.